…I kinda have a slight problem with it. 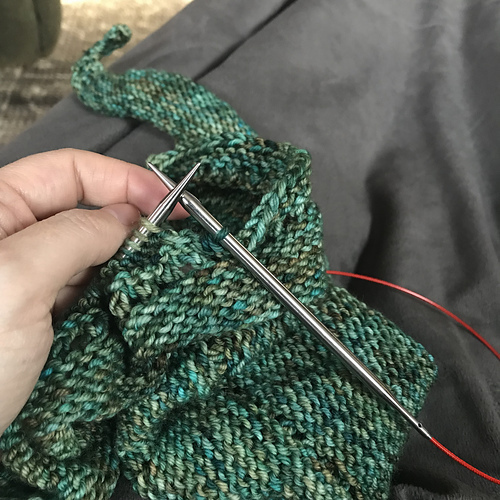 So, to help myself keep track of what the hell I’m doing and what the hell I’ve gone and signed myself up for I’m going to try to post an update on progress and knitalongs/along-alongs and spinning on Fridays. Yeah, I know it’s Saturday. Read the first sentence. Next, I signed up for The goal I set for myself is to #1 buy my own wheel (check) and #2 spin enough yarn to knit a pair of socks (working on it). So far I’ve finished the first hank-o-roving, filled a bobbin with it and I’m about halfway through the 2nd. What hank, you ask? Why, it’s Vesper Hand-Dyed Roving in the colorway ‘Afterglow’. Okay let’s see what else….